Seizures and epilepsy are not the same. A seizure is an event – a disruption of the normal electrochemical activity of the brain – and epilepsy is a disease of the brain characterised by the tendency to have recurrent seizures. There are many different types of ‘epilepsies’ and people’s experiences differ greatly. Under certain circumstances, anyone can have a seizure and not all seizures are diagnosed as epilepsy. When people have an epilepsy syndrome that is age-dependent and grows past the relevant age, or if someone has been seizure-free for 10 years, with no antiepileptic medication for 5 years, their epilepsy is considered “resolved”. Epilepsy is a common disease of the brain where there is a tendency to have recurrent seizures. It is a neurological disorder—not a form of mental illness—and seizures are caused by a temporary disruption of the electrical activity in the brain. Approximately 3% to 3.5% of Australians will experience epilepsy at some point in their lives and over 250,000 Australians currently live with epilepsy. Epilepsy can start at any age although it is more likely to be diagnosed in childhood or senior years. Children represent approximately 40% of the population with epilepsy. There are many different types of epilepsies and people’s experiences differ greatly. Some types of epilepsy last for a limited time and the person eventually stops having seizures. For others, epilepsy is a life-long condition. However more than two thirds of people with epilepsy become seizure free with medication. The cause of epilepsy can be identified in about half of people with epilepsy, but the remaining half never find out why they have epilepsy. degenerative conditions affecting the brain (such as dementia). Seizure classification is a way of naming the many different types of epileptic seizures and putting them into groups. In 2017, the International League Against Epilepsy revised its classification of seizures to make diagnosing and classifying seizures more accurate and easier. Some of the words you may have heard to describe seizures, such as ‘tonic-clonic’ are still used while others, such as ‘partial’ and ‘grand mal’ have been replaced with other terms. Whether the seizure involves movement. Most people will only have one or two seizure types. Sometimes a person with more complex or severe epilepsy may experience a number of different seizure types. Focal onset (formerly known as partial seizures) means the seizure starts in just one (focal) region of the brain. It may spread to other areas of the brain. These seizures can often be subtle or unusual and may go unnoticed or be mistaken for anything from being intoxicated to daydreaming. About 60% of people with epilepsy have focal onset seizures – which are also simply known as focal seizures. Focal aware: the person is fully aware of what’s happening around them but may not be able to talk or respond (formerly known as simple partial seizures). They are usually brief, and are often called a warning or ‘aura’ (that a more significant seizure may develop) but are actually part of the seizure. Focal impaired awareness: awareness is affected (formerly known as a complex partial seizure) and the person may appear confused, vague or disorientated. A focal seizure may progress to a bilateral tonic-clonic seizure meaning that it starts in one area of the brain and then spreads to both sides causing muscle stiffening and jerking. 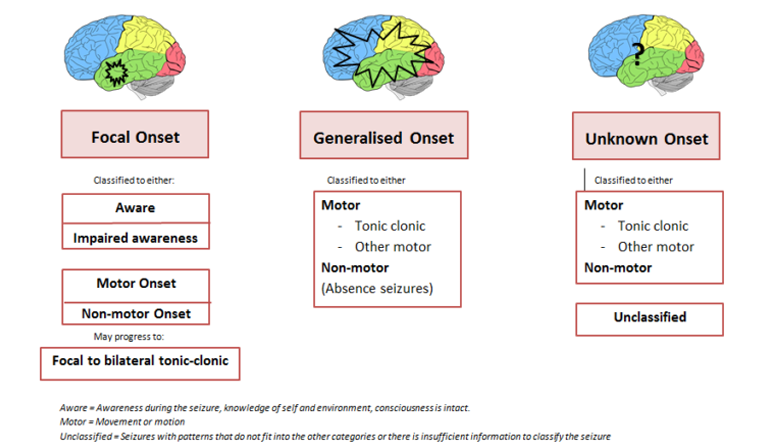 Generalised non-motor seizure: These seizures involve brief changes in awareness, staring, and some may have automatic or repeated movements like lipsmacking. Tonic – Can occur when a person is asleep or awake and involves a brief stiffening of the body arms or legs. The person will suddenly fall if standing or sitting. Atonic – brief seizures that cause a sudden loss muscle tone and the person often falls to the ground or will have a sudden head nod if sitting. Unknown onset means the seizure cannot be diagnosed as either focal or generalised onset. Sometimes this classification is temporary and as more information becomes available over time or through further testing, the type of seizure may be changed to a generalised or focal onset seizure. Rarely, doctors might be sure that someone has had an epileptic seizure, but can’t decide what type of seizure it is. This could be because they don’t have enough information about the seizure, or the symptoms of the seizure are unusual. Most people will only have one or two seizure type(s), which may vary in severity. A person with severe or complex epilepsy or significant damage to the brain may experience a number of different seizure types. Classification of a seizure can stop at any level. For instance, “focal onset” or “generalised onset” seizure with no other elaboration is acceptable. This can be extended to descriptors such as “focal sensory seizure,” “focal motor seizure,” “focal tonic seizure,” or “focal emotional seizure,” and so on. Focal seizures are classified by whether awareness is retained or impaired (altered). If awareness is unknown, then they are simply classified as a focal seizure. Sometimes a focal seizure does not alter consciousness and the person is aware of what is going on around them during the seizure. These seizures are known as focal aware seizures. People often refer to these seizures as their “aura” but they are actually a seizure which may or may not lead on to a more significant seizure. For instance, the seizure may spread to become a focal impaired awareness seizure or evolve into a bilateral tonic clonic seizure. Focal emotional seizures – characterised by feeling emotions such as joy, sadness, anxiety, fear or panic. In some types of focal seizures, the person has a change in awareness, consciousness, and behaviour. These are called focal impaired awareness seizures. They can also be called focal seizures. After the seizure, the person is often confused for a short time, and may not remember anything that happened before or during the event. The most common absence seizure is the typical absence seizure. There are other less common types of absence seizures that are briefly discussed here. An absence seizure starts and ends abruptly, is very brief with altered awareness during the seizure. Absence seizures usually begin in childhood (but can occur in adolescents and adults) and are easily missed, or misinterpreted as daydreaming or inattentiveness. These seizures can happen numerous times a day causing learning to be disrupted. They generally respond well to medication. The seizure does not start and end as suddenly as a typical absence, it can be more gradual. They are often seen with other features such as loss of muscle tone of the head, trunk or limbs (often seen as a gradual slump) and subtle jerking. These seizures often occur in people with intellectual impairment and complex epilepsies. The loss of awareness may be minor with the person continuing an activity, but more slowly or with mistakes. Rhythmic myoclonic jerks of the shoulders and arms and lifting of the arms during the seizure can be seen. The myoclonic jerks are usually seen in both arms, but may be one-sided or not symmetrical. Puckering (jerking) of the lips, twitching of the corners of the mouth, or jaw jerking can also be seen. Sometimes rhythmic jerks of the head and legs may occur. Seizures last 10-60 seconds and typically occur daily. The level of awareness varies from complete loss of awareness to retained awareness. These are absence seizures accompanied by brief, often rhythmic, fast myoclonic jerks of the eyelids at the same time with an upward movement of the eyeballs and of the head. This can look like fluttering of the eyelids and simultaneous rolling back of the eyes. These seizures are typically very brief and occur many times a day. After the seizure there is usually a period of confusion, headache, soreness and sleep. A myoclonic seizure is a seizure where a single jerk or series of single jerks (very brief muscle jerks) occur. They frequently affect the upper body, neck shoulders and arms. A person having a myoclonic seizure usually has sudden jerks on both sides of the body at the same time. They vary in severity but can cause someone to spill or drop what they are holding, or fall off a chair. If severe enough, a myoclonic seizure can also cause a fall. The seizures are often mistaken for clumsiness before diagnosis. Note: Even people without epilepsy can experience myoclonus or sudden jerks just as you are falling asleep. These are normal and not seizures. A tonic seizure involves increased muscle tone of the body usually very brief, lasting a few seconds. If the person is standing they will suddenly fall stiffly to the ground. This is often termed a “drop attack” (astatic seizure). Tonic seizures often occur during sleep and in clusters of varying intensity of tonic stiffening. The person is unaware during these events. At the beginning of tonic seizures with more intense stiffening, people may make an exhalation or loud sigh sound. With more severe and prolonged tonic seizures the person may look like they have a tremor or shaking. Tonic seizures often occur in people with intellectual impairment or more complex epilepsies. An atonic seizure is a type of seizure that involves the sudden loss of muscle tone. If standing, this can cause a “drop attack” where the person suddenly slumps to the ground. If sitting, a simple head nod (as if the person is trying to fight off sleep) may be seen. These seizures are very brief, less than 2 seconds and may involve the head, body or limbs. Atonic seizures often occur in people with intellectual impairment or more complex epilepsies. A clonic seizure is a seizure involving bilateral rhythmic jerking and may occur alone or in combination with tonic (increased muscle tone) activity typically lasting a few seconds up to a minute. The jerking in a clonic seizure is more sustained and rhythmic than seen in a myoclonic seizure. As the jerking stops, it is common for the person to let out a deep sigh, then normal breathing resumes. This is a relatively new classification. the inability to classify the seizure as either focal or generalised onset. Unknown onset seizures are not truly separate types of seizures, but temporary labels for seizure types for which the onset is unknown. As more information becomes available over time or through further testing, the seizure type may be changed to a generalised or focal onset seizure. For instance a person reports having a tonic clonic seizure, but the start of the seizure was not seen. Therefore it is uncertain if it was a focal or generalised onset. These spasms are longer than a myoclonic jerk, but shorter than a tonic seizure. Each seizure lasts only a second or two but they usually occur in clusters, several in a row. There are many different types of epilepsy classifications. Nowadays, most people are given a specific diagnosis or name for their epilepsy, rather than just told that ‘you have epilepsy’. Some types of epilepsy are classified as syndromes and are defined based on a unique combination of symptoms. A diagnosis of a particular epilepsy syndrome is useful in deciding the possible treatment options, what course the condition may take, and the possible genetic risk of passing it on to offspring. Why do so many seizures happen during sleep? Epilepsy has a complex connection with sleep. Seizures during sleep can occur with any type of epilepsy. Some people have seizures occurring only during sleep whilst others have both daytime and night-time seizures. People who have only night-time seizures in their sleep are defined as having pure nocturnal epilepsy. It is estimated around 12 percent of people with epilepsy have nocturnal seizures. Why do nocturnal seizures occur? Epileptic seizures are often strongly influenced by the sleep-wake cycle. When we go off to sleep, we have a change of state – from awake to asleep. But during sleep, there are many changes of state also, which are called sleep stages. It is thought that a change of state has an effect on the brains ‘epileptic activity’ in people with epilepsy. Some seizures occur predominantly at a certain stages of sleep. and this whole cycle occurs 3-4 times per night. There are dramatic changes on EEG during these sleep stage changes. Sleep is divided into 5 stages: Non-REM Stages 1, 2, 3, and 4 and REM sleep. Seizures don’t seem to happen during REM sleep, but may occur at any other time during the sleep cycle, often in light sleep – that is, stages 1 and 2 of sleep. Nocturnal seizures can also occur when waking or stirring during the night. Within the first hour or so after awakening (early morning seizures). Seizures that occur during sleep may also happen during a daytime nap – they are not limited to night time. This is when you start falling asleep, and is usually brief. Your brain activity heart rate and breathing start to slow down. You begin to reach a state of total relaxation in preparation for the deeper sleep to come. This is also known as slow wave sleep. Your brain waves further slow but there may still be short bursts of faster of brain activity. If you were to be suddenly awoken during this stage, you would be groggy and confused, and find it difficult to focus at first. This is where you experience your deepest sleep of the night. Your brain is mostly slow wave activity, and it’s difficult to wake someone up when they are in this stage. REM sleep means rapid eye movement, which characterises stage 5. Your blood flow, breathing, and brain activity increases, but your muscles go into a paralysis-like state. The brain activity is similar to when you are awake. It can be difficult to diagnose nocturnal seizures because they happen during sleep, and the person may not be aware of them happening. Also, nocturnal seizures can be confused with some sleep disorders. As with most other forms of epilepsy, a good history of the seizures, or even better, an eyewitness account is very important for diagnosis. The doctor may also suggest a video sleep EEG, often done during the day after being sleep deprived. If left undiagnosed, the person may suffer from a lot of daytime sleepiness. This can impact concentration, attention and learning as well as behaviour and emotions resulting in reduced quality of life. Are there specific types of epilepsy where people have nocturnal seizures? Nocturnal seizures can be any type of seizures. Sometimes they are too subtle to detect. Can they change to daytime seizures? If a person has seizures only during sleep for several years, the chances of the seizures happening during wakefulness is small. However this does not mean daytime seizures won’t occur. For example, in situations of extreme stress or sleep deprivation, medication changes or withdrawal, the risk of a seizure is increased, day or night. Daytime seizures may also occur if someone with nocturnal epilepsy decides to take a nap, or even becomes excessively drowsy during the day. With good seizure and lifestyle management however, the risks of a daytime seizure can be greatly reduced. Maintain the same bedtime and rising times as much as possible. If you have tried and failed to improve your sleep, there are many sleep specialists that can help. Smoking in bed is unwise for everyone and particularly so for a person with nocturnal seizures. There are a number of devices for night-time seizure monitoring that are now available for use in the home. They are designed to recognise that a seizure has occurred or that breathing has been disrupted, triggering an alarm so that assistance can be provided. This is a rapidly developing area of research. Investigation into the development and the benefit of such monitors is ongoing and at this time there is no evidence to show that using an alarm or device can guarantee the safety of a person experiencing nocturnal seizures. However, some families have found monitors to be a useful part of a risk reduction plan. Speak to your clinician about whether a device is something that you might choose to use. Some people advocate for the use of special pillows to allow better airflow around the face. The use of special pillows has not been proven to prevent death from suffocation nor guarantee the safety of a person having nocturnal seizures. The use of a special pillow is a personal choice. Finally, people who experience seizures exclusively during sleep may be allowed to drive. Relaxation: There is an App called Brainwave which combines binaural tones with relaxing ambient music, soothing nature sounds, or your own iTunes Music to help you relax and sleep.